Wandsworth council’s plans to start charging users of the Battersea Park Adventure playground have sparked outrage amongst local people. The scheme, due to start in October, would see weekend users paying £2.50 per child to enter the play area. 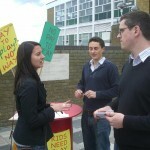 Opposition has come from local groups like Women of Wandsworth who have started a campaign – read more here, and an online petition is now available that runs until 4th June 2011. Other groups include Battersea Labour. This entry was posted in Battersea and tagged campaign, pay to play, petition by Blogger. Bookmark the permalink.